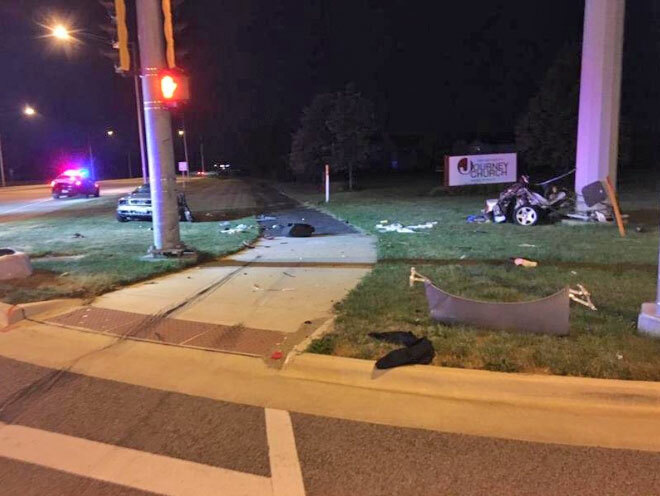 Huntley police and firefighter/paramedics responded about 2:30 a.m. Sunday to a report of a serious crash at Algonquin Road and Haligus Road. Police upon arrival discovered a 1999 Audi w split into two halves — front and back. The front of the vehicle was still occupied by a single occupant. A 35 year-old male driver was extricated from the vehicle by the Huntley Fire Protection District and transported to Centegra Hospital-Huntley. The man suffered severe injuries in the crash. Preliminary investigation indicates the vehicle was traveling at a high rate of speed on westbound Algonquin Road and struck a traffic control signal standard on the northwest corner of Algonquin Road and Haligus Road, according to Huntley Police Department. Some lanes were closed during an extended accident investigation, and all lanes were reopened by 6:00 a.m. Following the on-scene investigation, police are continuing the accident investigation. Huntley Crash Algonquin Rd splits car in half [Click or touch this photo to enlarge slightly].